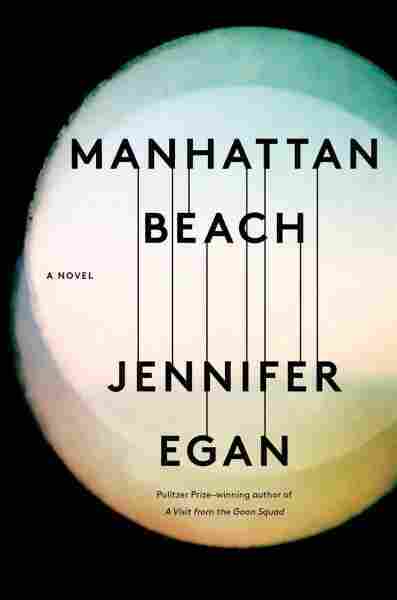 In 'Manhattan Beach,' Jennifer Egan Dives Deep Into WWII New York City Egan began researching her new novel years before she published A Visit From The Goon Squad. It follows a girl who becomes the Brooklyn Navy Yard's first female deep-sea diver during World War II. 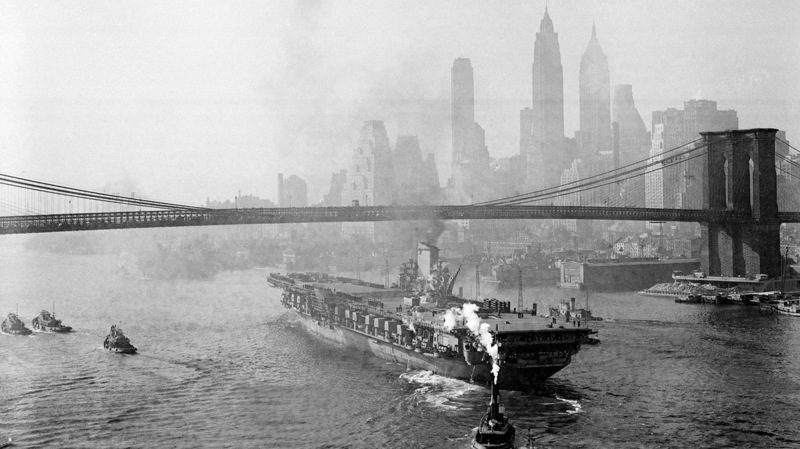 The USS Franklin D. Roosevelt sails down the East River after leaving the Brooklyn Navy Yard in 1945. Jennifer Egan's new book follows a woman who works the Brooklyn Navy Yard during World War II. In 2011, Jennifer Egan won the Pulitzer Prize for her novel, A Visit From The Goon Squad. Years before that book came out, Egan had begun researching the 1930s and '40s in New York City. Her new novel, Manhattan Beach, is the result of that research. It follows a father, his daughter and a gangster whose lives intersect in New York around World War II. The daughter, Anna, becomes the first woman to work as a deep-sea diver at the Brooklyn Navy Yard, which presented a particular kind of challenge for Egan: In reality, there were no women divers at the Brooklyn Navy Yard. She says, "One of the big technical challenges of my storytelling was: How can I do justice to what I know would've been a very, very poisonous atmosphere ... while also making it credible that she actually becomes a diver? And in a way, what came to my rescue was the fact that it was wartime and all kinds of things were happening then that would not happen at a normal time." She was extremely helpful to me in understanding the difficulty of being a female diver. I mean, diving is a very physical undertaking, and so she was very articulate about the challenges of doing that as a woman, and especially the prejudice that she encountered. Men did not want her there and they made that very clear. There were certain exceptions, but she ultimately had a sad feeling about her diving career in that she felt that she would have liked to continue with it but that it was uncomfortable because she was a woman. There's a very strong association of veteran Army divers, and one of the things that they offer to their members is the chance to wear the old Mark V diving suit. The Mark V is the iconic diving suit with the cylindrical metal helmet, the big bulky profile, the metal shoes. Anyone would recognize it. And for a very long time, through the Vietnam War, that was the costume that was worn for diving. And so I had a chance to put this on. It felt excruciatingly heavy. There was a tremendous amount of pressure right at the top of my shoulders. ... I was thrilled to have the experience of being in it, and yet I couldn't have wanted it off any more. One visit that I remember vividly was with the husband of a woman whose correspondence I had read at the Brooklyn Historical Society. Her name was Lucille Kolkin, and she married a guy named Alfred Kolkin, whom she met while they were both working at the Navy Yard. They had this huge romance, and then he joined the Navy and she wrote passionate, colorful, wonderful letters to him. So it was amazing to go into the machine shop, Building 128, where Al had worked as a machinist many, many years before. He had not been back. The machine shop, when he had been there, was, of course, full of machinery and noise and chaos. Now it was completely empty with a big, strong, cold wind blowing through it. And to watch that man standing there with his walker looking around this empty space was really a profound experience. I would go so far as to say that I mostly write terrible things. I mean, my first drafts are so appalling. I think, "Ugh, there's no way I can possibly get there." With this book, more than any other, I thought very seriously about abandoning it, [that] I may have just picked a situation in which I'm so ill-informed in virtually every area that the book takes place, that I cannot cross over to make this work. It was such a thrill to finally feel like I had imbibed enough information that it felt natural to me. It felt like time travel actually. It was really fun, and I even want to do it again, which is something I never thought I would hear myself say. Jessica Cheung and Becky Sullivan produced and edited this interview for broadcast, and Sydnee Monday and Nicole Cohen adapted it for the Web.